1. Black long-sleeve shirt w/mandarin-type collar with fold-over bib. 2. Black flat front tight-fitting pants no visible pockets. 3. Black equestrian-type knee-high boots. 4. Luke’s ROTJ hero lightsaber hilt. 5. Luke’s Endor commando style camo poncho. 6. Black leather glove on right hand. 7. Black army style web belt. 8. Luke’s Endor commando style helmet (with decal). 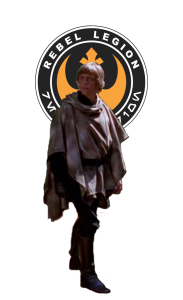 Characters’ hair needs to be a “similar” style to that of Luke Skywalkers’- no buzz cuts or beards also. 1. Black or dark grey vest w/scarf-style tabards and wide sash belt. 2. Black leather belt with silver weathered octagonal buckle.